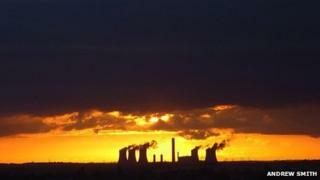 Oxfordshire's Didcot A Power Station has been turned off after 43 years in service. RWE npower announced the closure of the 2,000 megawatt (MW) coal-fired station in September, after opting out of the EU's Large Combustion Plant Directive. Phil Noake, Didcot A's station manager, called it a "very sad time for everyone at the power station". Nine months of decommissioning begins on 31 March, with demolition of the six towers expected to take several years. The station was disconnected from the national grid at 14:00 GMT. Former power station worker Lyn Bowen, who originally connected Didcot to the national grid in 1970, returned to the plant to flick the switch to disconnect. Mr Noake said: "I would like to thank the teams who have helped to deliver power to homes and businesses across Britain for over 40 years. "We would like to extend our thanks to the local community who have supported us throughout these years." Greenpeace campaigner Ben Stewart, who climbed the towers in 2006, said it marked the beginning of the end of coal burning in the UK. He added: "Off shore wind is where we should be focusing, given Britain is the Saudi Arabia of wind, and we should grasp the opportunity to make a huge investment there. "We're the last generation that can do something about climate change. We're right at the crunch point." Country Life readers voted the landmark Britain's third worst eyesore in 2003. It opted out of the EU's Large Combustion Plant Directive, which is aimed at reducing emissions across Europe. That meant the plant had to cease generation by the end of December 2015 at the latest, or once an allocated number of operational hours were completed.